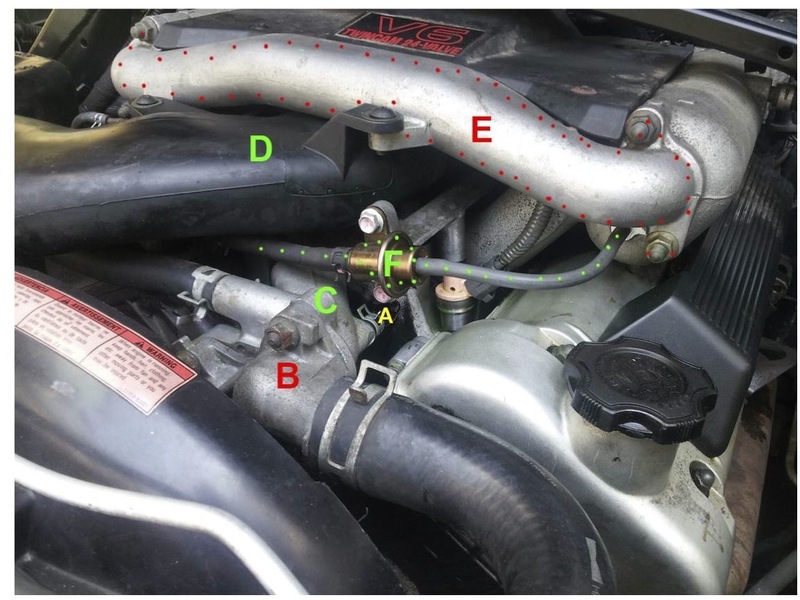 I need to replace a small coolant hose on my Suzuki Vitara, 1996 2L V6. It's very hard to access - it comes out of the back of the thermostat housing and goes down into the left bank of the engine. I need to remove some things to get to it, and I haven't done a job quite like this before. C – this is really in the way - it looks like it goes back a fair way….can I take it out? D & E – What is E? if I need to remove both of these parts, is that possible? F – what is this? Can I take it off if I need to get it out of the way? Some guidance would be very much appreciated! Things look pretty good there for a now 20 year old! Great. OK - Things you need out of your way that are threaded nuts or bolt put a drop of some penetrating oil on now so nothing breaks. If pic doesn't show I used words "auto hose clamp tool" for images and that was page 1 of the millions. You may want to rethink doing this yourself. I a good one of what's shown above can be $300 bucks and IDK if it can be rented? The smaller hose in your pic you could do with just the assortment of pliers and carefully. Be easy on yourself and aim them so you can get at them another time for any reason more easily. Also know when you "violate/drain" cooling system you will have issues bleeding air out up to needing a vacuum fill tool yet more bucks as some you really fight to get last air out to refill at risk of harming the engine. Not to discourage at all just the right tools make this fast and easy vs DIYing what should be easier. Nothing shown looks even hard IMO with the plier assortment but most folks don't have 100 types like I do. The hose and item marked "F" I'm not sure but is probably a vacuum hose as there are no clamps on one side of brassy thing which is possibly a check valve as a source or maybe for evaporative emissions - not sure but could be removed and replace any hose traumatized in doing so. It's good of you to be paying attention to this stuff. As said it looks remarkably good for the age. Added comment: Even this old some hose is still better than some junk you might buy new so watch out for that. OE quality and may take a dealer? Give it some thought about costs of tools you may only use once. That and risks of anything not just right really could cause harm up to a disaster as some molded new hose isn't so perfect and can rub where OE ones near certainly didn't. This really needs to be done without removing any of that stuff. Most of it isn't going to help you anyway. D and E are intake pipes that aren't in you way anyway. B is the thermostat housing and there is no benefit to removing that,. The only thing that is really in your way is the housing C and you aren't going to be able to remove that one anyway so changing it in place is about your only option. F is the fuel pressure regulator and it is sealed to the fuel pressure rail and you really don't want to disturb that seal if at all possible. That's just a can of worms you should avoid.